I admit I have not read the book, but I intend to. 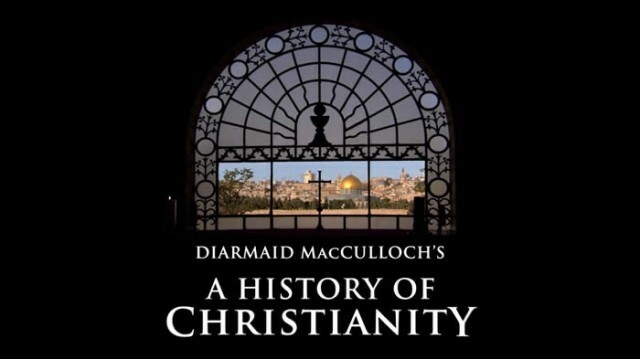 The author of the book and writer/narrator of the series is Diarmaid MacCulloch, professor of the history of the Church at the University of Oxford. MacCullough’s views must come with a disclaimer: He was ordained a deacon in the Church of England but refused ordination to the priesthood because he didn’t wish to deny his homosexuality. Such embitterment may explain why the TV series’ presentation of the Western Church is uneven: For every macrocosmic hilltop there is also a dung heap. MacCullough offers an all-too-human portrait of St. Augustine of Hippo as a sexual deviant turned celibate who pronounced original sin as the reason for Christ’s coming. MacCullough is pitch-perfect in his rationale that the Roman Empire never really collapsed; it is alive and well today and called the Roman Catholic Church. Then there is MacCullough’s unlofty opinion of St. Francis of Assisi, which reflects the darkly abstract painting of Francis by Bruno’s mother in Hitchcock’s Strangers on a Train. MacCullough says, “Was Francis of Assisi the lovable saint who talked to animals? Or was he somebody who madly chucked away wealth to proclaim Christianity to birds?” And, like an itch that won’t go away, MacCullough harps again and again on the “petty awfulness” of the Crusades. At its best, MacCullough’s document of the Western Church is no rival for the series’ journey to the east. We follow MacCullough to modern-day Syria, where he gestures at a pillar now worn to a nub. In the early fifth century, Simeon, a pillar saint or stylite, devoted his waking hours to standing atop the column. Simeon believed this life is “our valley of tears” and barred himself from all bodily conveniences. But Simeon was not a hermit seeking to torture himself in solitude; his 50-foot column was a short distance from a crossroads, and he welcomed guests. Is the ruin the last remnant of Eastern Christianity in the wake of Islam? Not exactly. MacCullough travels to Damascus, where he visits the Syriac Orthodox Church, an ancient Christian sect that emphasizes ritual (its priests raise communion bread overhead before breaking it to symbolize Christ’s resurrection) and authentic language (its members speak Syriac, a dialect of Aramaic). A Syrian Orthodox priest MacCullough encounters has this to say: “Whereas in the West theologians are philosophers, here theologians are poets.” The priest’s words are backgrounded by Muslim prayer. Nearby is the Umayyad Mosque, where John the Baptist’s head is entombed, according to Muslim tradition. We learn that John the Baptist is regarded as a prophet in Islam and – contrary to the radical Islamic factions that make headline news – Jesus Christ, while not recognized as the Son of God, is sometimes known as “the son of light” in Islam. But my favorite is the installment on Eastern Orthodoxy, a Christianity that was brought lovingly to the Russian people by hermits then nearly obliterated by Islam, betrayed by crusading Catholics and besieged by the politics of the Tsars and Communists. Yet, today the double-headed eagle of the Eastern Orthodox Church is the symbol of its people. When Joseph Stalin declared Christianity dead – butchering 40,000 priests, monks and nuns to prove his point – in favor of atheistic community, it was his people’s quiet faith that staved off the Nazi war machine at Stalingrad and Leningrad. Just ask the Russian people. MacCullough does – with powerful results.